Jane is one of my all time favorite designers. The website link doesn't work anymore. Can anyone fine the candy cane pattern with the Wayback Machine? This is a another pattern from the folder. 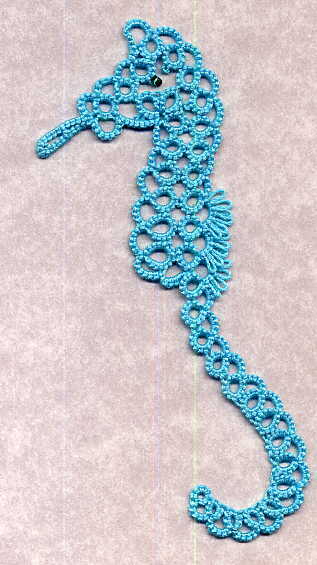 This one is Deb Arnold's Sea Horse made with Omega size 30. 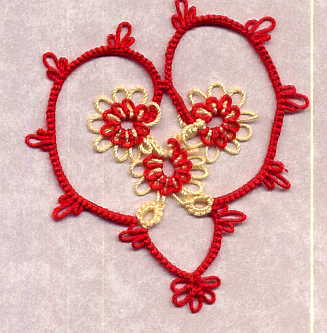 Just for practice, I used the directional tatting/wrapped stitches for the chains. I hadn't used that technique in quite a while and was pleasantly surprised how quick and easy that motion soon became. While you're there, check out the rest of the site. I'm still drooling over the varigated threads. I've got this big folder of internet patterns to make someday. (Doesn't everyone?) This seemed like a good opportunity to pull some of those out. I worked it in Cebelia size 30. 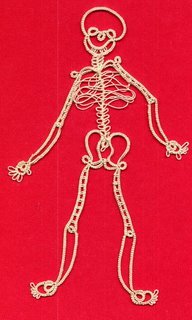 I made this with 3 ply of embroidery floss. I have a bag of old cross stitch supplies, so for small motifs I find floss to be an excellent quick source for colors I need. This is my skeleton featuring pearl tatting for the spine. The jaws need a little work, and next time, I think I will join the arms a little higher on the neck and add a set of ribs. But over all, I'm pleased with it and I don't think I'll have time to do it again before Halloween. Blocking will help -- I just time to iron it a little tonight. This was the rough draft. Not bad, but I decided the chains outlining the ribs were too busy, so that the pearl tatting effect was getting lost. Motif Four, Or...What Was I Thinking? 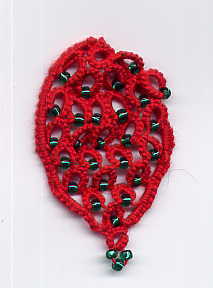 Here is a Maltese ring bookmark. The multicolored chain seemed like a neat idea when I thought it up around midnight one night. But by light of day, switching shuttles and having to readjust the thread lengths every four stitches is a major pain in the neck. This is DMC perle cotton size 8, I think colors 744, 311, and 799. Working the Thistle Pin, the rounded shape of the tatting and the texture of the beads suddenly made me think of strawberry seeds. I wanted to change the shape so that the taper to the point would be shorter. 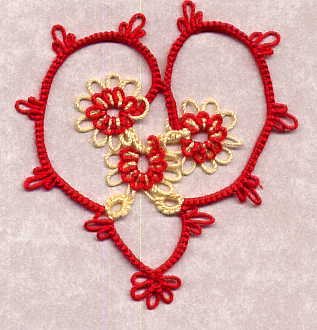 I tried using fewer, larger rings and then decreasing the ring size in later rows, but I didn't like it. I decided to make the rings more like Rita's original design. 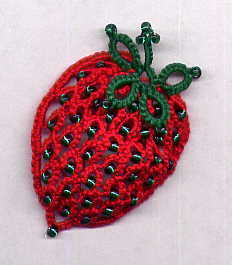 Meanwhile, I had decided it would be better to begin with the leaf cap rather than try to attach it later. I experimented with different rings for the leaf cap instead of trying to make it neat. 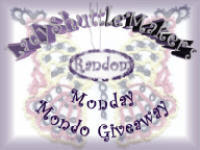 Since this was definitely not going to be a final draft, I left off the beads to save time. 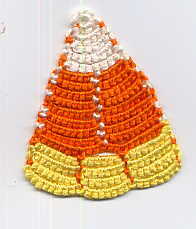 Final version = Motif Three! 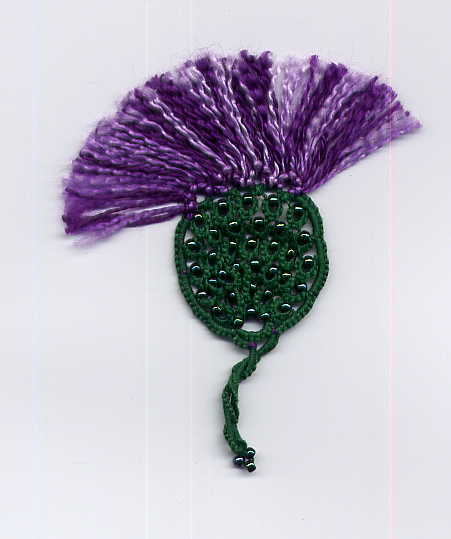 This is Rita Cochrane's Thistle Do Pin which she recently shared with the Online Class. It's different from the sort of thing I usually do, but I thought my horizons needed broadening. 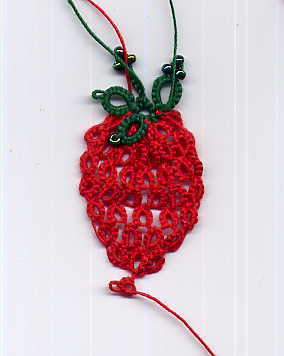 I was afraid the split-chain like border might be tedious, but it wasn't bad, and I like the effect. I used Cebelia size 30 for the green, and two shades of Perle Cotton size 8 for the purple. I kept saying I didn't have time for this, but you folks are having way too much fun, so count me in. 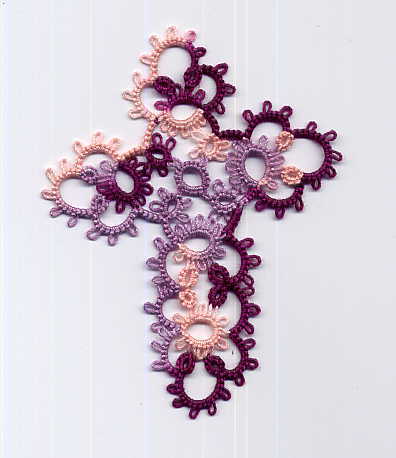 For my first motif, I chose Donna H's Happy Accident Cross which she adapted from a Blomqvist & Perrson motif. This really is an excellent little cross pattern. I'm using an Omega size 30 thread, color #850.